As part of our advocacy efforts, representatives from the Guild frequently travel to Washington for lobbying, meetings, and conferences on issues impacting authors. 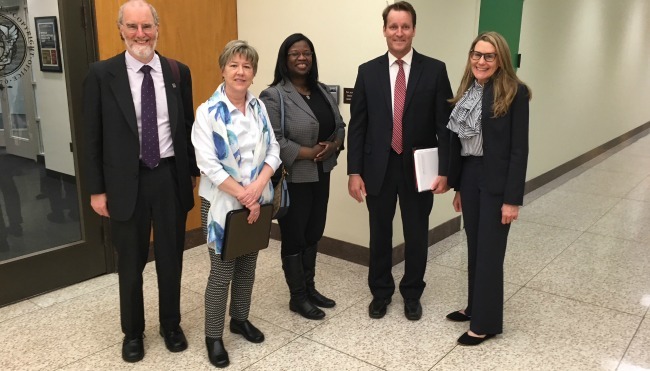 On April 17 and 18, 2018, the Guild’s Executive Director Mary Rasenberger and General Counsel Cheryl Davis, together with Rick Carnes and Charles Sanders, the President and outside counsel of the Songwriters Guild (respectively), met with Representatives on both sides of the aisle to lobby for the small claims copyright bill (the “CASE Act”). Over the course of a day and a half we met with a number of Representatives, including Doug Collins (R-GA), Louis Gohmert (R-TX), Hakeem Jeffries (D-NY, one of the lead sponsors of the bill), Zoe Lofgren (D-CA), Ted Deutch (D-FL), and Jamie Raskin (D-MD), as well as with staffers for John Ratcliffe (R-TX), Ron DeSantis (R-FL), Jim Sensenbrenner (R-WI), and Raul Labrador (R-ID). We gained additional support for the bill (and Rep. Deutch has since signed on as a co-sponsor), and addressed last-minute concerns raised by Amazon, the Internet Association, and the Computer and Communications Industry Association, which prompted some additional changes to the bill. These changes will be incorporated into an updated “discussion draft” that will be re-circulated to the House Judiciary Committee for their review and consideration. We will keep our members advised about the progress of the bill; in the meantime, please reach out to your local representatives to express your support for the bill. While in D.C., we also met with Maria Pallante (President), Allan Adler (Executive Vice President and General Counsel), and Lui Simpson (Vice President, Global Policy) of the American Association of Publishers to catch up on various topics of mutual concern, including piracy issues, and the implementing legislation for the Marrakesh Treaty to Facilitate Access to Published Works for Persons Who Are Blind, Visually Impaired or Otherwise Print Disabled (which is about to move to the Senate floor for a vote). On April 19 and 20, Mary attended the annual meeting of the IP section of the American Bar Association; she is currently the vice chair (formerly chair) of the IP Section’s copyright division, and is a member-elect of the Council. At the annual meeting, she spoke on a panel titled “Fair Use or Not Fair Use, That Is the Question” about recent fair use cases involving literary works. On April 21, Mary took part in a panel for the D.C. Author Festival titled “I’ll Do It Myself” about indie and self-publishing. This annual festival for local D.C. authors is organized by the D.C. Public Library and was held in partnership with the Library of Congress this year in the Library’s Madison Building. Approximately 200 authors attended this year’s festival. On May 8, we returned to D.C. and joined with representatives of the National Writers Union, the Science Fiction and Fantasy Writers of America, and the American Society of Journalists and Authors to meet with the Copyright Office about a proposal to allow group copyright registration for articles by the same author. The Authors Guild organized this joint meeting as part of our efforts to coordinate lobbying among author groups; it is more important than ever that we join together and speak with one voice, given the forces authors collectively are up against. We received a welcoming reception from the Copyright Office, with six of their lawyers attending the meeting, including Sarang Damle, the Office’s General Counsel, and Rob Kasunic, the Associate Register and Director of Registration Policy & Practice. We described the need for a procedure permitting authors to register their written works as a group, whether published online or in print, due to the prohibitively high cost and inconvenience of having to register short pieces individually. Given that registration fees are either $35 or $65 per work (depending on what form is used to register), it rarely makes financial sense for an author to register short pieces that may have only brought in a few hundred dollars (or less) in income. Or to annualize it, if a freelance writer were to publish and register two pieces a week, the total cost of registration would be over $6,500 a year. Because it makes so little economic sense to register the copyright in blogs and other freelance works at the time they’re published, freelance writers lose out on the ability to receive statutory damages (and instead must prove actual losses, which may be relatively minimal) or to be reimbursed their attorneys fees if they prevail. Without the potential to receive statutory damages, which range from $30,000 to $150,000 for willful infringement per work infringed, it does not pay to litigate most infringements of short pieces, and so often the copyright law is not enforced and infringement goes unpunished. There is currently a process by which authors can register their “contributions to periodicals” within a twelve month period as a group—but most works posted online are not considered “contributions to periodicals” as that term is interpreted by the Copyright Office. Moreover, that group registration process is only available for works that are “published,” and it is unclear whether many works posted online are considered published under the Copyright Office’s pre-digital, technical definition of “publication”—which means distribution in tangible copies. The Copyright Office quickly understood the various concerns expressed by all four groups and expressed a willingness to work with us to aid authors and encourage registration by making it cost-effective. We will follow up with the Copyright Office to develop new regulations to permit group registration for all articles an author might write during a time period—whether published or posted online or in print—and will continue to collaborate with these other groups on issues of common interest for authors.